Come and fly with us! Central Oregon Aerial Arts is the premier, professional aerial silks program in Bend, Ore.! We now also offer TRAPEZE! Looking for a way to get fit and have fun, all while trying something new? Check out aerial arts. Group and private classes are available and we offer both drop-in rates and punchcards for discounted rates. Contact us for more information or check out our schedule for details on class times and rates. Plus, we have the room for you to fly. With NINE or more silks up at all times, you will always have access to equipment during class. We know you'll have the room to stretch your wings and learn in a safe and open environment. With more than 20 years combined experience, our professionally trained lead instructor, Kendall Knowles, and beginning silks instructors Lauren and Amberly, will teach you how to fly on silks with Peter LoVerso taking the help on Trapeze! 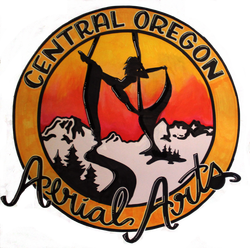 Read all about Central Oregon Aerial Arts instructors. And remember, safety is our No. 1 priority. Students are required to adhere to all safety precautions, including the strict use of safety pads. Students will not be taught any skills beyond their abilities and instructors are always present. We guarantee a safe place to fly! Still have questions? We have answers! Check out our FAQ page or Contact Us today! Ever wanted to try aerial silks? Central Oregon Aerial Arts is your place to learn how to grow and fly! Book your class ONLINE today!